Ronnie Young adjusts her glasses. Her deep black hair reaches down her back in a neatly combed ponytail. She walks the forest trails behind Yukon College in Whitehorse where she currently lives, camera in hand. Lowering herself to the ground, she begins to frame a shot of the Yukon’s official flower, the fireweed. The purple nail polish on her fingers compliments the colour of the flower petals. The sound of a low-flying plane landing at the nearby airport pulls Ronnie’s attention skyward. She casts her eyes to the clouds with an ever-present childlike wonder. She raises her lens and looks for the plane among the treetops. The shutter clicks. After becoming friends with a professional photographer a few years ago, she was hooked on the camera lens. "I kind of got obsessed with getting closeups of bears and moose, and going out on the land and out on the mountains." Photo by Adam van der Zwan. The peace Ronnie feels from capturing images of wildlife was not so easy for her to find earlier in life. Ronnie, of the Kaska First Nation and Crow clan, was born in 1962. She grew up in Watson Lake, an Alaska highway town of about 800 people in southern Yukon. Ronnie says that where she grew up was exclusionary to anyone who felt or looked different. “You’re either white or brown, boy or girl,” she says. Both Ronnie’s parents and her grandparents attended residential school. 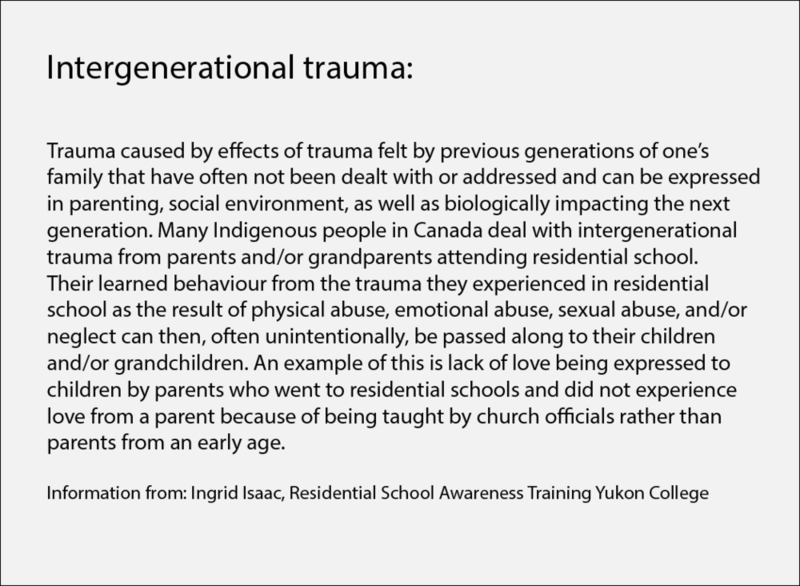 Her upbringing, though positive at times, was steeped in intergenerational trauma. Ronnie’s mother died when she was 11. She says her family has also grappled with addiction and suicide. “I grew up around a lot of people that drank a lot. They’d been hurt a lot by residential school,” she shares. Though Ronnie did not attend residential school, she couldn’t escape Canada’s attempts to eradicate Indigenous ways of life. From the age of six to 10, Ronnie attended day school in Watson Lake. The only difference between residential school and day school is that Ronnie was able to go home at the end of the day, instead of staying in lodging far from home. Throughout her years at St. Ann’s Catholic School, Ronnie says she encountered violence from administrators and other students. She was targeted by students for being different and was then punished for fighting by the principal by being strapped on the palms. She learned from a young age that she couldn’t live as her true self. Her energy was devoted to surviving an environment where racism and violence were common. As early as six, Ronnie was defending herself from violence at school. When Ronnie was too small to fight for herself, her cousins fought for her. Eventually, they told her she needed to fight her own battles. In her teens, Ronnie started bodybuilding out of a home gym. “You either get beat up or get stronger, so I got stronger,” she says. Ronnie didn’t feel good about fighting. It wasn’t a choice for her, it was a matter of survival. Eventually, she was able to help others like her cousins had helped her. The violence didn’t come exclusively from students. Administrators, principals and teachers used physical discipline. “I know I got strapped a lot,” she says, remembering the pain across her palms. She grew accustomed to it. “You can’t let the teachers know it hurts,” she says. “We had some teachers that weren’t really nice. I’ve seen some teachers grab kids by the back of their hair and lift them off the ground and drag them out of the class. It wasn’t pretty,” she explains. She faced another profound challenge: she was born as a boy. At 10 years old, Ronnie realized she was transgender. To protect herself from additional hardship she kept her identity secret, growing up and presenting as male. She wasn’t able to transition until she was in her 50s. The residential boarding schools, such as those that Ronnie’s family attended, imposed a rigid gender binary in which there were only two options: male and female. Any notions of gender held by Indigenous nations were excluded, says Harlan Pruden, a two spirit community organizer and scholar. Pruden is a member of the Saddle Lake Cree Nation in Alberta and is a PhD student at the University of British Columbia. He’s studied the interactions of queerness, Indigenous culture, and colonial influence through the interdisciplinary studies graduate program. He says Indigenous people who went through the residential school system adopted the European binary understanding of gender; that there was only male and female. This differed from the diverse beliefs of gender in various First Nations. In Pruden’s Cree tradition, “we see someone from a trans experience as having a gift and a purpose, as someone walking a new path. For that, you have something to offer that I, as someone who is cisgendered, cannot offer. We celebrate that,” he says. 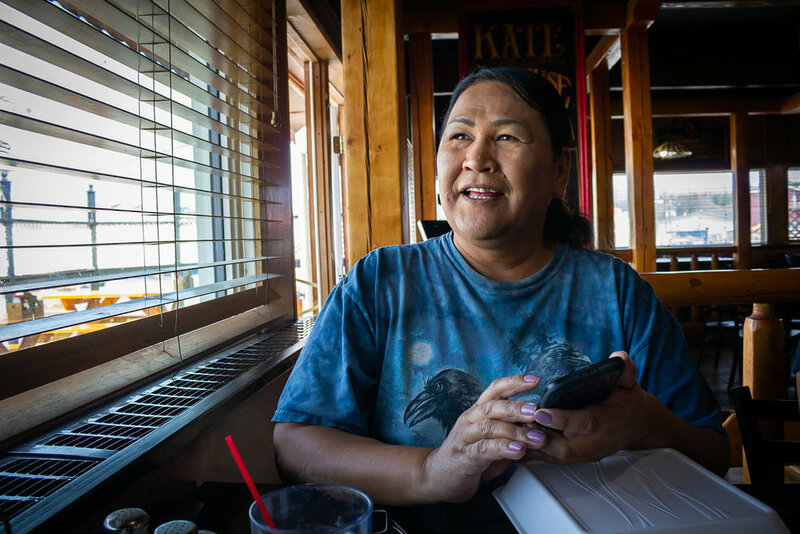 In Ronnie’s Kaska tradition, two-spirit people were seen as special members of society. She says they were considered leaders and healers. However, there is little to no discussion about transgender people who were excluded from the narrative. For Ronnie, living so long without being able to express her true self made it necessary to adopt coping mechanisms. She turned to alcohol, the same tactic used by some of her family members, as well as many other Indigenous people facing trauma. Growing up, Ronnie put the notion of transitioning out of her mind. Eventually, with the help of her father, Ronnie quit drinking completely and hasn’t had a drink in several years. Her father’s advice was to change and work on whatever was really bothering her. He didn’t know, but his words encouraged her to start her transition. She pursued wildlife photography, education, and eventually a medical transition. Ronnie often goes out onto the land, either on her own or with a dog to keep her company. In the summer, she goes out as often as once a week, and stays for a couple of days. She camps under the Yukon skies, hunts, fishes, and documents her adventures on her camera. Despite her prayers, Ronnie has had multiple bear encounters. Bears are often the subjects of her photos. While out in the bush, Ronnie has encountered grizzly bears and black bears, sometimes in groups (Ronnie Young, 2017). These bears were spotted by the side of a road (Ronnie Young, 2016). Bears feature prominently in her photography. (Ronnie Young, 2017). 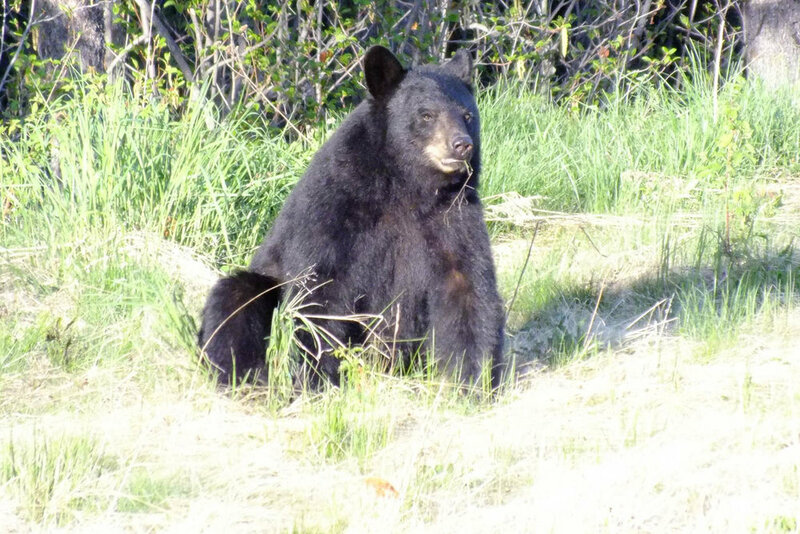 This bear had a recent encounter with a porcupine and walked away with quills in its behind (Ronnie Young, 2016). Ronnie originally learned photography from a friend, and became obsessed with taking pictures of wildlife. Wildlife and outdoor photography by Ronnie Young. She had many opportunities to take photos while attending the University of British Columbia as a mature student. Ronnie is the first person in her family to graduate from university. As of spring 2018, she holds a degree in anthropology. To support herself, she performed odd jobs. She was a hockey referee for 15 years, managed a few convenience stores, and cleaned government buildings. She also sought out and won scholarships and bursaries from her university to support her education. Before going to school, Ronnie focused on her transition. It was 2014 when she finally found a doctor who would help her. She says her previous doctor declined to help her transition because of religious reasons. With her new doctors, she began taking estrogen pills and testosterone blockers. In 2017, at 54 years old, Ronnie underwent gender-reassignment surgery. “I wanted to die, holy jeez! When the first pain hit me,” she says. Ronnie was given painkillers to help her recover from surgery. She says her family, mainly her brothers and sisters, stopped talking to her because they couldn’t tolerate the change. Ronnie’s daughter and grandchildren still keep in touch, but she doesn’t see them frequently. Ronnie has visited the Shoppers Drug Mart in Whitehorse a number of times, looking to her friend and makeup professional, Akiko Allen, for advice on makeup and other beauty products. Photo by Adam van der Zwan. The pain had a purpose. Ronnie was finally living as her true self. She relied on the community around her for support. She made friends easily, and soon garnered a support network. One such friend is Akiko Allen, who Ronnie affectionately calls Kiko. She is a professional makeup artist from Whitehorse. 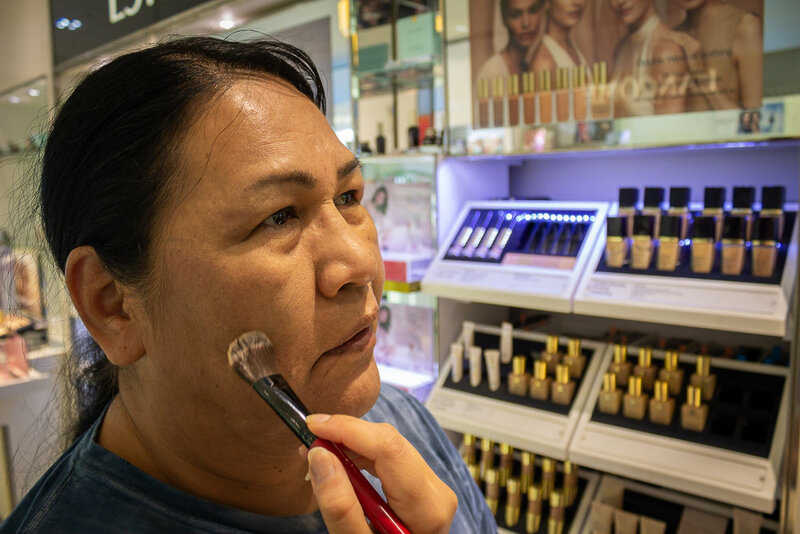 Akiko Allen, a makeup artist at a Shoppers Drug Mart in Whitehorse, applies makeup to Ronnie's face. Not so long ago, Ronnie didn't have a clue how to use beauty products. "I met her one day (in the store) and I said, 'can you keep a secret, until I learn? '," recounted Ronnie. "She said 'Hey! As long as you're comfortable in your own skin, that's fine by me.' And we became good friends!" Photo by Adam van der Zwan. Kiko teaches Ronnie how to apply makeup and skin care products. The pair meet up every other month to do Ronnie’s makeup. “It feels really, really good to help someone open up and be who they truly want to be,” Kiko says. “I feel good. I don’t have to hide anymore. I can be out in the open and go to pride parades. There are laws now that protect gay and trans people,” says Ronnie. When Ronnie is asked what she's most proud of, after all these years, she immediately replies with "living." But she's also proud of her kids. "I always tell [them] I love them, no matter much they hurt you, or don't listen to you." Photo by Adam van der Zwan. Ronnie attributes her strength to her grandparents. “My grandparents are pretty influential in my life. I grew up with them. My grandfather went to residential school a long time ago and he always told me to be strong, especially when I’m out on the land by myself," she says. Ronnie’s connection to her culture doesn’t end with the advice of her grandparents. She is also relearning the Kaska language through the University of British Columbia’s Indigenous languages program. Ronnie is pursuing a master's degree in anthropology with plans of getting a doctorate. She is most interested in learning more about the history of Indigenous people in the Yukon, how they got here and survived here from the time of the last ice age. Ronnie Young sits in the Legends Smokehouse and Grill restaurant in Whitehorse. "I go here all the time," she says happily. The servers greet her with a warm, familiar smile, and soon enough, Ronnie tucks in to a large plate of pancakes, sausages and hashbrowns. Photo by Adam van der Zwan.